Tracy Novinger and her husband sell real estate, but don’t hold that against them. Tracy has put together a neat little video clip about Patzcuaro and its surroundings. Catch upon the latest chisme about what new business is opening and what’s closing. And, of course, catch up on the kidnapping score. But when it’s time to really chill, we head over to ex-Hacienda La Petaca, north of town and halfway on the way to Dolores Hidalgo. The excitement there will amount to hearing distant drums from La Cuadrilla, watching packs of feral dogs roam, happening upon an occasional lost shoe, listening to the broccoli grow and gazing upon a newly-turned compost pile. And reading. If it’s chocolate on your pillow at night you crave, you’ll have to bring your own. This is a place to bask in peace and quiet, to ponder the stars out at night, to entertain yourself. You can consult the guidebooks and those clever little pieces about 36 hours in San Miguel de Allende all you want, but none of them hold a candle to what attracts us when we venture 150 miles north of Morelia. And return home with a bag of freshly harvested jicama, straight from the fields of Celaya. What are the odds that Mexicans think of themselves as socialist rather than capitalist? 0.81 to 1, making Mexico #1 in how we perceive ourselves as individuals in Latin America, leaving Panama a close runner-up. Go here for the Gallup Poll results, which include perceptions of how Latin Americans views their countries. Credit goes to Two Weeks Notice: A Latin American Politics Blog for pointing us in the right direction. From the time the owner of Bookworm, an Omaha bookstore, handed me Simple Cooking and told me to read (and buy) it, more than two decades ago, we’ve been smitten, taking him to bed with us nearly as often as we’d tune on and turn in with Rush Limbaugh. Like a good fairy tale or maybe, to others, a sonnet, his books bear reading over and over again like a good-night story. 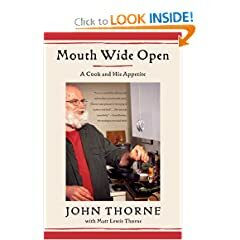 John Thorne isn’t your usual food writer, all caught up in sous-vide (which as far as I’m concerned, Birdseye came up with long ago), slow food, ethically responsible food, whatever that is, and sustainable farming. 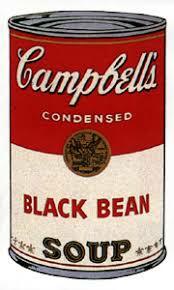 He openly admits to a fondness for canned tamales, cilantro sandwiches, and rightly admits, as anyone with good taste food ought, that there is no better than Campbell’s black bean soup, doctored only with a spoonful of sherry. He reviews cookbooks, researches the history of important dishes from macaroni and cheese to menudo, and still finds time to experiment. He may not have gotten pozole down just right (but you’ve got to cut a guy from New England a break), but we’re forever in his debt for introducing us to chicken with forty cloves of garlic. We bought Pot on the Fire, Outlaw Cook, and Serious Pig, as soon as each was published, just because John Thorne had written them. Frankly, neither measured up to Simple Cooking, but that didn’t stop us from picking up Mouth Wide Open: A Cook and His Appetite—and we’re happy that we did. At last, Thorne’s back to what made him love us in Simple Cooking. In What’s Spanish for Quagmire, Jorge Castañeda explores and punctures the five myths surrounding Mexico’s (and your) war on drugs. Los Estados Unidos lost its war on drugs, just as surely as it’s going to lose that war in the Middle East. It’s time for some rational heads to prevail. Over at the Woodrow Wilson International Center for Scholars Mexico Institute appears an English translation of Jorge G. Castañeda and Hector Aguilar Camin’s article which originally appeared in Nexos. Go here. When God’s not busy hating Africa, he hates girly men. There was time that we were so concerned about keeping the New World’s men from fates like that that we laid the groundwork for Miss Suzy’s RealMan™ Academy, place where parents with enough money could send their sons who showed signs of being too nice to old ladies and tendencies toward philately and numismatics for RealMan™ lessons in things like killing grizzly bears bare-handed and flossing their teeth with tumbleweeds. But we’ve been beaten to the punch, not only by The Dangerous Book for Boys but now by The Art of Manliness, which even lists 45 manly hobbies. Ham radios, ships in bottles, gardening, reading, and computer programming still live on! Any man who doesn’t profess an interest in at least one of these hobbies is hopeless. Personally, we always thought men who favored magic were the best.